At Woodhouse, we give our higher achieving students every chance of gaining a place at Oxford or Cambridge University. Our Principal, John Rubinstein, personally oversees our support system and our programme starts a year before applications take place. We encourage students to start the process of engaging with their subject beyond the A level syllabus as soon as possible. This includes joining study groups and meeting with like-minded people to discuss texts and articles or solve problems that go beyond the demands of normal classwork. We organise and oversee trips, visiting speakers and summer schools as part of a comprehensive programme that mostly focuses on specific subject areas. We bring in admission tutors from Oxford and Cambridge and invite students and parents to come and find out more about the whole process and give them the chance to ask questions. Christ Church and Christ Church Horizons (We placed 12 students this year on the 6-week Horizons programme, have organised trips to Christ Church college and welcomed visiting speakers from there. Trips to Gonville & Caius College in Cambridge. Oxfizz (new this year): Extensive Oxbridge programmes to help with choosing course, entrances tests and interviews. Some subjects such as history, maths and law have special entry examinations in early November, so we offer specialist subject support for these. We also assist those students who have to take a thinking skills test. Additional support is available for those taking the Cambridge maths STEP paper, which is sat after the A2 exams. Staff who have specialist subject knowledge give our students intensive interview practice, as do our governors. We have close links with Pentland Brands, a company that employs many Oxbridge graduates, who come to Woodhouse to give one-to-one interview practice, which provides additional valuable insight. Students then go to interview in early December. Our track record from offer to exam success and then acceptance is almost 100%, but obviously not all students get an offer. Typically, around one in three of our applicants are offered a place. Virtually all Oxbridge applicants nationwide are straight A or A* students so of course not all can get an offer, and sometimes very good students don’t make the cut, which is harsh but an inevitable reality. Our application-to-offer conversion rate compares well nationally, and we strive each year to forge further Oxbridge links for our students. Typically, in the past decade, a dozen or so have received offers. 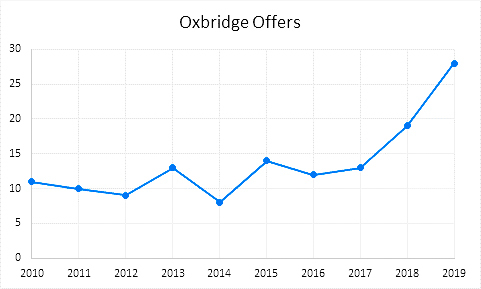 However, with our increasingly focused approached, that number has been growing and in 2019 an unprecedented 30 of our students have received an Oxbridge offer.